New! Introducing our new BBQ Pork Pizza. 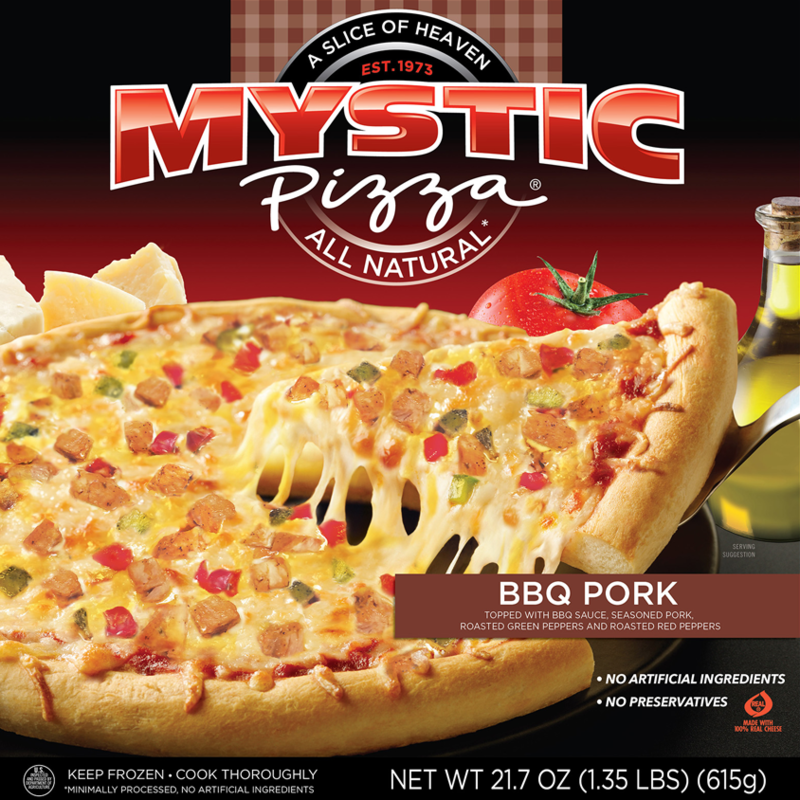 This incredible Pizza starts with our Famous Mystic Crust then we add our new secret recipe BBQ sauce, seasoned pork, roasted green peppers and red peppers. If your looking for a little BBQ you’ll this pizza is for you! INGREDIENTS: CRUST: Wheat Flour, Water, Corn Oil, Yeast, Sugar, Salt, Baking Powder (Cream of Tartar, Sodium Bicarbonate), BBQ SAUCE: Corn Syrup, Tomato Paste, Water, Sugar, Vinegar, Salt, Worcestershire Sauce (Distilled Vinegar, Molasses, Sea Salt, Sugar, Spices, Tamarind), Smoke, Pineapple Concentrate, Citric Acid, Spices, Garlic, ALL NATURAL FULLY COOKED CAJUN STYLE DICED PORK: *Minimally Processed, No Artificial Ingredients, Pork, Water, Sugar, Salt, Spices, Paprika, Garlic Powder, Onion Powder, CHEESE: Whole Milk Mozzarella Cheese (Pasteurized Milk, Cheese Cultures, Salt, Enzymes), Cheddar Cheese (Pasteurized Milk, Cheese Cultures, Salt, Enzymes, Annatto [Color]), ROASTED GREEN PEPPERS, ROASTED RED PEPPERS.